I have had many questions answered by the forum members which have helped me enormously as a SWL learner. I have a random wire antenna about 90 feet long and about 25 feet high in the air. The wire is at different angles in a rough square shape with one side missing. 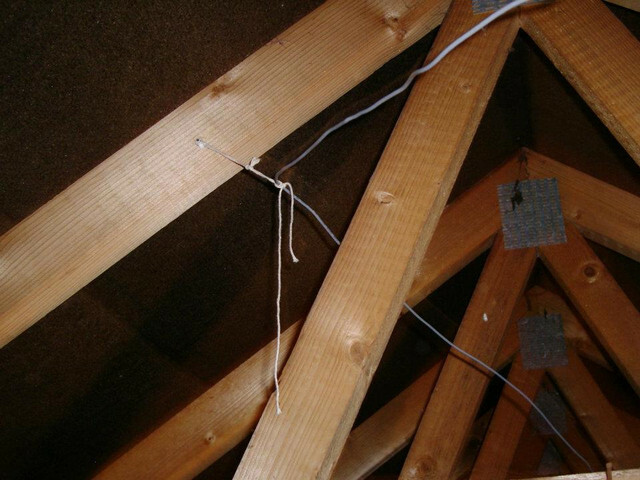 One leg is 42 feet, another is 26 feet and the other is 23 feet then a piece of the same wire from one of the legs down to the eaves where I have joined it to the centre conductor on some RG213 I had hanging about just to get rid of any spurious stuff (if any) as it goes through the loft then down to the receiver. My radio is a Tecsun S2000. There are two external antenna inputs for shortwave. One input is for 50 OHM, the other input is for up to 500 OHM, with one a red input for the wire and a black input for the ground. I use the radiator copper pipe in my shack for the ground which is about 4 feet away from the receiver, which has continuity with the stop tap out in the pavement about twenty feet away. I have built a couple of ATUs just as a learning curve. What I would like to know is do I need an ATU if I I use the 500 OHM inputs. According to the handbook for the radio it is just a matter or using the random wire straight into the inputs. Sometimes it takes a while for the grey matter to kick in. 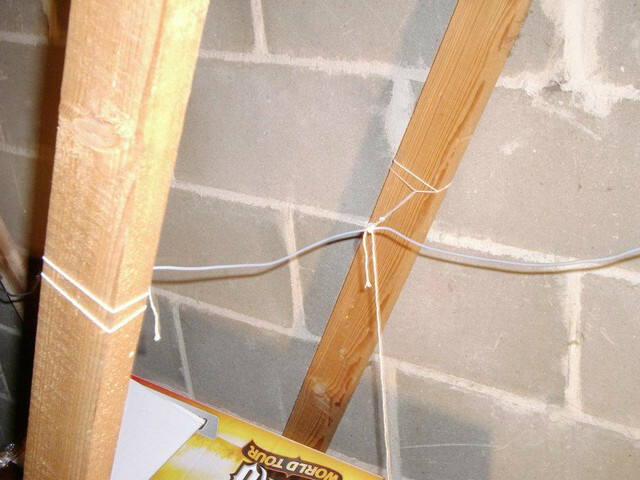 Also where the random wire joins with the centre conductor on the RG 213 as it enters the eaves is it advisable to have the braid shielding attached to a ground in the garden if it would help with any noise. Hope you can help. I am spoilt for choice with the inputs really, I sometimes use the 50 OHM shortwave input an attach it to my Discone 1300 antenna which is 50 OHM. I do get around the place sometimes as far away as Peru in the east (this morning) and last week Trans World Radio in Swaziland. Best wishes and thanks. The first thing is you may find is that such a long wire into a radio designed to work as a portable radio over loads it & drags in loads of unwanted noise. I use around 10 meters of wire on portable radios, as like that they get a better antenna but nothing that should over load them & pull in too much noise. Antennas are a compromise. Longer antennas have advantages & disadvantages, the same with short. The next thing is DO NOT use the heating system as an earth, as that is very likely going to insert a lot of electrical noise into your radio & that is the good point. A copper rod into the ground is much better, but do not make the earth wire between radio & earth rod too long & check what type of earthing system your home has before using any earth. There is a problem for us with the way most houses built after about 1970 have been wired & the same with many that have been rewired. As they no longer earth our homes, house by house, with an earth stake at each. But at the local transformer. So if an electrical issue occurs at any house in that system, your plumbing could become the earth for every home on the circuit & thus electrically live if you use it as an earth. I would not use coax to feed a random wire. Unless I were using a balun. And if I were using a balun, I would feed that against an earth rod. It is what I do when operating portable with a tranciver. A balun allows you to use a very short length of wire to a earth rod at the antenna feed point & that adds a little extra potential noise reduction into the system. I will not confuse with the reality of Baluns, but those used by SWL's are normally un/un's not bal/un's, that is they are unbalanced to unbalanced, not balanced to unbalanced. But in general most people call them baluns. Even if they know the difference. A simple description of a balun is. Two lengths of unconnected wire wound around a circular transformer. With one wire giving one ratio & the other wire giving another. So 4 to 1. 9 to 1 etc. And still keeping it simple, the ratio of turns on the wires tells you what the balun transforms the signal by. Normally SWL's use a 9:1 un/un. But not always. One antenna configuration to think about, is using some twin feeder, to feed your wire, instead of coax. This would use the wire not connected to your antenna as a counterpoise wire, in the way that a Zepp (Zeppelin) antenna does. Any random wire is going to have places where it is very high impedance & way beyond the 500 Ohms & others where it is closer to 500 or 50 Ohms. And twin feed would not add in some 50 ohm coax to the mix of the antenna, as you could use 500 Ohm twin feed. In general, things that help with noise are, not using radiators as earths, keeping antennas in clean air, not over loading the radio & things like using a balun. As a balun inserts an electrical break into the antenna system & gives you a good place to insert an earth rod. Thanks for advice Alan I will study it. My place has high end electrical safety thanks to the council and everything is on a trip. The place was built in 1962 and there is only about 15 inches at most of soil, after that it is just beach being so near to Dungeness. That is why I attached the "radio" ground to the radiator pipe as they did in the earlier days. About 20 years ago I had a Radio Shack DX 349, I attached the "radio" ground to a copper rod outside my bedroom window which worked OK. I made a small no nonsense matcher out of a radio magazine from a bit of broomstick and windings of copper which was enameled and a crocodile clip to different points along the inductor. I received a transmission from the South Island New Zealand weather station, so the 1 meter copper rod must have worked OK. But the radio had a slight accident with water and the grand kids so that was that until recently when I picked up the interest again. I am still wondering if I need the ATU?. I will try the Zepp idea as I am waiting for some 300 OHM ladder line from Moonraker but it seems to have gone missing in the delivery system. I can't get the wire in a dead straight line does it matter if it is a dogleg. Sorry for so many questions again. You see in places talk of 8 feet of rod hammered into the ground as a radio ground, does the shallow soil and beach still do the job for ground. Silly question but where the wire goes into the eaves there is a plastic dustbin below where my wife has her bay tree growing out of it, would that also be of any help as to the radio ground?. If I am missing something here pleas feel free to let me know as I want to learn. Best wishes Mike. mike43 wrote: My place has high end electrical safety thanks to the council and everything is on a trip. The problem with adding earth stakes if your home has what is called Protective Multiple Earthing, PME is that your house trip switch does not always behave as it should when a fault occurs in the wider system, if you add an earth inside your homes electrical system without getting professional advice, or thinking it through carefully, then if something goes wrong, you or someone else could die. The RSGB use to do a really good basic PME leaflet. But all I can find now are ones that do little to help explain why we need to take care. However the following is part of the BRATS advanced amateur radio training syllabus. 9f.1 Recall that in PME systems the main earth terminal is connected to the neutral of the electricity service at the consumers' premises and that all metal pipes and fittings within the premises are also connected to the PME bonding point. Recall that under severe fault conditions PME systems have the potential to cause fatal electric shocks and/or fires in amateur radio stations. In brief, this method of electricity supply involves bonding all of the house metalwork together, and this will include any radio earth you have provided. With the ATU, I very occasionally use one for SWL'ing & they can be helpful, I think. But they are not always helpful if you are just tuning around the bands, as you need to retune every few hundred khz. My main SWL ATU is a Global model, which has band pass filters & adjustable Q, so I can not just optimise the signal that I want, but also filter out a lot of unwanted rubbish too. My SEM (amateur radio) ATU has a noise bridge, which is great for SWL'ing, as it allows me to easily tune the antenna with no transmitted RF. But I am split on ATU's for SWL. They can make a difference, but they are really only of any help, if you are listening to one small segment of spectrum & I like to tune around & I am not totally convinced that an ATU makes a big difference any how. I really like my Global because I can filter out of band noise out & almost notch out unwanted close by stations using the Q adjustment. With dog legging an antenna, it makes some difference but not much, if any in the real world. My loft antenna is zig zagged all over the place & still works reasonably well. The SWR is higher than it should be on some bands, but it still RX's & TX's very well concidering how much I have compromised it zig zagging it around my loft. When I pop my short wire up, that is when using my Eton Global. I just hang it up around the room & always seem to get good service from that. I normally crocodile clip the wire to the retracted telescopic antenna. Here in Norwich I could get a rod deep into the soil. But when I lived in the Hunstanton area, I had chalk at about 2.5 feet below the ground. Do what you can, but don't compromise your safety by feeling that you need to add a earth stake, or feel that without an earth rod your station is compromised. Get what you can from the hobby. But beyond a portable radio & a short telescopic antenna, everything else is a bonus. And remember, if you do not connect your radio to the mains, then you can safely use all the earth rods that you want, regardless of what earthing system your home uses, as your radio will never become part of the electrical earthing system. Plus batteries isolates you from all that mains borne interference. Thanks to all for advice, very helpful for a newbie. Yesterday afternoon I left things as they were and just tuned around. I received stations from Vietnam/Africa/Voice of Korea/Radio Romania Int' etc and plenty of Europe. In the evening I received stations from USA/Peru/Havana and some more. I used the ATU or is it AMU being a matcher? and it worked as it should. I know it has to be adjusted for every band but as a learner I have the patience. I don't think my radio will get overloaded as it has a 3 stage antenna attenuator built in to minus 20dB, and I have also added a 1 k ohm linear potentiometer as an added attenuator, plus RF gain. I am reading at the moment as much as I can about the amateur bands and the receiving of because last week or so I was listening to a chap on the Isle of Hoy on LSB. This peaked my interest. There is so much to learn and trying to keep it in the grey stuff is a bit slow but the penny drops now and again. As far as the earth stake for the radio ground, maybe I am getting somewhat confused here. It is outside in the garden about five feet from the radio. I have a series of copper pipes into the ground linked together with 10 mm copper earth wire. It is a bit dry at the moment as you might imagine. As said earlier the soil in my garden is very shallow and then beach. I give the area some water now and again to keep it damp. This ground stake is also connected to the radiator which is also about five feet from the radio in the other direction. There was not very much noise at all because of the radiator pipe connection and the stations were very clear when I used the ATU (AMU). I seem to remember reading about a chap in the USA using cat litter around his copper stake as he has stony soil. Isn't cat litter some sort of clay like fullers earth?. Thanks again and if I have bored some folk sorry about that. mike43 wrote: I used the ATU or is it AMU being a matcher? . Other than by altering the antenna there is no way to tune it. So every so called ATU is actually an AMU, as all they do is present a mismatched antenna as a match at the radio. ATU is another thing like a Balun. We use a term that we hopefully know is incorrect. mike43 wrote: I seem to remember reading about a chap in the USA using cat litter around his copper stake as he has stony soil. Isn't cat litter some sort of clay like fullers earth?. Thanks again and if I have bored some folk sorry about that. Yes & someone I use to work with insisted that Fullers Earth, Cats Litter was what you also find in a Mars Bar.